Where to download free folder icons? Folder Marker features User Icons tab – a special place where you can add your own custom icons to the program. Your own collection of modern icons will help to make your folders look more expressive and give you a clearer idea of what each folder keeps inside. Marked with your own icons, the folders will be easier to find and navigate through. They will look fresher, more meaningful and beautiful than before. Now, where do you find those special, custom-designed and preferably free folder icons? 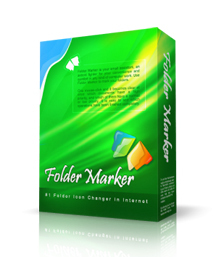 The simplest and quickest way is to buy our Everyday Folder Icons. It is a collection of over 60 Vista-style icons, created by professional designers. The collection includes a wide range of icons for all occasions and costs only $19.95. Icons drawn by design experts will give your applications a professional look, improve user experience and inevitably boost sales.